Very Good, Very Good, YAYYYYY!!!!! Coming Soon.... Video/Skype Yoga and Laughter Sessions at Yoga Hillsboro for people who can not attend my classes in person. Now we all have something to laugh about!!! HO HO HA HA HA! Laughter Yoga is a revolutionary idea – simple and profound. An exercise routine, it is sweeping the world and is a complete holistic workout. 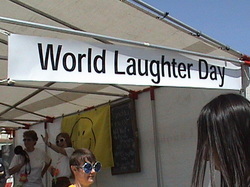 Please visit LaughterYoga.org for more information.